A Babylonian scholar who settled in Narbonne, France, at the end of the eighth century and whose descendants were for many generations the leaders of that important community. According to a tradition preserved by Abraham ibn Daud in his "Sefer ha-Ḳabbalah," Machir was a descendant of the house of David. He was sent to Narbonne by the calif Harun al-Rashid at the request of Charlemagne, who, it is said, received the Babylonian scholar with great honor, conferred upon him and his descendants the title of "king of the Jews," and gave him a section of the city of Narbonne. Although this relation between Machir and Charlemagne is probably legendary, it is a fact that the Machir family enjoyed for centuries many privileges and that its members bore the title of "nasi" (prince). Benjamin of Tudela, who visited Narbonne in 1165, speaks of the exalted position occupied by the descendants of Machir, and the "Royal Letters" of 1364 (Doat Collection, pp. 53 et seq., 339-353) also record the existence of a Jewish "king" at Narbonne. The place of residence of the Machir family at Narbonne was designated in official documents as "Cortada Regis Judæorum" (Saige, "Hist. des Juifs du Languedoc," p. 44). 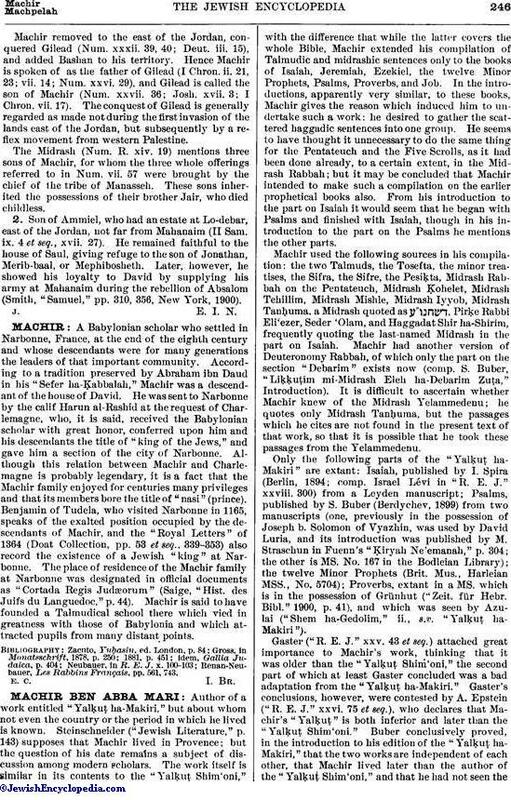 Machir is said to have founded a Talmudical school there which vied in greatness with those of Babylonia and which attracted pupils from many distant points. Renan-Neubauer, Les Rabbins Français, pp. 561, 743.